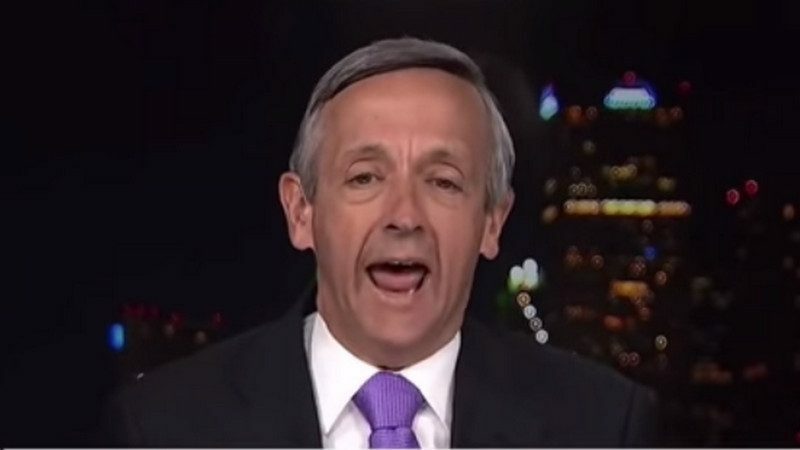 While religious leaders from across the political spectrum have criticized the Trump administration’s policy of separating parents and young children at the border, Robert Jeffress, one of President Trump’s earliest and most adoring Religious Right boosters, appeared on Fox News today to spout right-wing talking points and tell Americans that they should thank God every day that Trump is president. Fox News host Shannon Bream asked Jeffress about recent comments from Sen. Kirsten Gillibrand saying that the Trump’s family separation policy is rooted in ideas that are evil and hateful. Bream said people on the Hill vouch for Gillibrand’s sincere Christian faith. Well, she may be sincere, but she’s sincerely wrong. To characterize the president’s actions in this as evil, to me is absolutely outrageous. Look, Romans chapter 13 does say God instituted government to maintain order and to punish those who commit evil. And to call the president evil for simply doing what God has given him the responsibility of doing, and that is protecting our borders and protecting our citizens, to me that is outrageous. And I think we ought to celebrate a president like President Trump rather than denigrate this president, for doing everything he can to fulfill his God-given responsibility. Yes, it is gut-wrenching to see these children separated from their parents at the border. The only thing more gut-wrenching is to see children like Kate Steinle separated from their parents forever because they were killed by illegal immigrants or MS-13 gang members. I know this president. He is a compassionate man. I’ve been in the Oval Office with him and seen him agonize over the DREAMers. But he has also said, ‘I have to keep America safe. I will not compromise American security,’ and again, I think we ought to thank God every day we have a president like that. 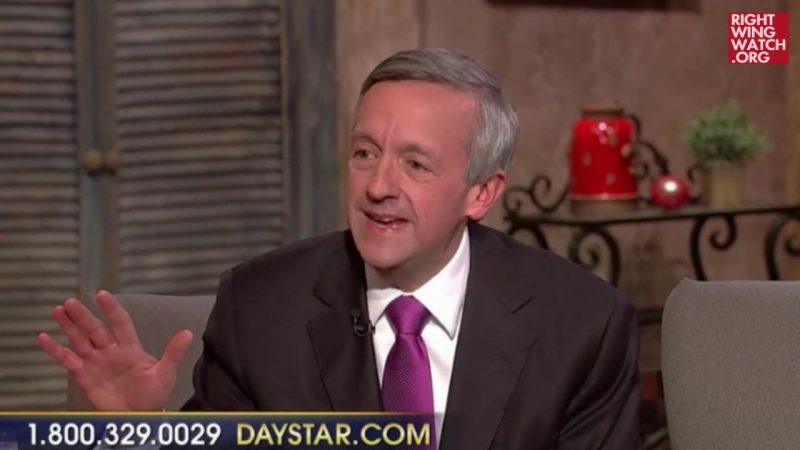 Jeffress was also on Fox for another reason this week: after coverage by the Dallas Morning News and critical comments from Mayor Mike Rawlings, a billboard company decided to pull down his church’s billboardd that declared “America is a Christian Nation.” Jeffress said the church was advertising a patriotic service this Sunday during which he would be preaching about “the evidence for the Christian foundation of our country.” It seems likely that Jeffress’ sermon will draw from the work of David Barton, the Religious Right’s favorite “historian” whose Christian-America history has consistently drawn criticism from actual historians. Jeffress said he believed the mayor “has shown hostility toward our church” in violation of recent Supreme Court ruling. Fox host Ainsley Earhardt said she was “a little shocked” that the mayor would consider “America is a Christian Nation” to be divisive. It’s true that our nation has always welcomed people of all faiths or no faiths, but it’s also equally true that by and large our founders were orthodox Christians who believed that the success of our nation depended upon our fidelity to God and to His word. Jeffress has celebrated that another billboard company stepped in to replace the two signs that were taken down with 20 signs around the city. Right Wing Round-Up: A Stormy Affair?